19 year old Cole Foglesong of Astoria, IL, a freshman biology student at McMurry College has already made an impressive mark in the deer hunting world as he has harvested an incredible 13 point buck during the fall 2003 deer season in Illinois. It was November 22, the first day of the Illinois shotgun season. It would turn out to be a beautiful autumn day with temperatures that would eventually reach near 70º. Cole was a bit late into the woods due to some pressing issues on the family farm. However he was finally situated just after daylight in a concealed ground hideaway in the large swamp on the family owned Black Gold Ranch in Western Illinois. 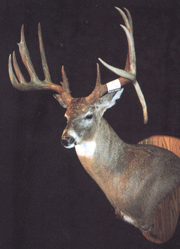 I have been hunting this area for several years as it is one of my favorite places to hunt. I had a tree stand nearby for bow hunting, but I like to stay on the ground for shotgun season and there was plenty of good cover nearby, Cole explained. He had been watching and listening for quite some time, but had seen nothing. At around 9:30 he heard a noise to his side and came to full alert. I spotted a very large deer moving from the swamp toward a nearby pasture field. I walked right over to the downed buck as it was still moving but not going anywhere, I watched as the life went out of it. I stared at the rack, it was huge just huge, bigger than I could have imagined. I sat and stared at the rack and the beautiful drop tine, it must have been 10 inches long. 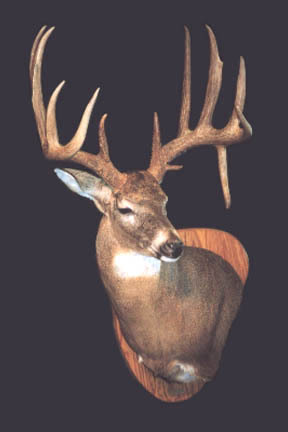 I counted the points once and then again as I stared at the buck, 13 points, WOW! Even then, lying there on the ground, I knew right away it was the same buck that dropped the sheds two years ago. They looked exactly the same, just a whole lot bigger, exclaimed Cole. I guess dad knew from the sound of my voice that it was more than just a small deer, but he and my brothers were all surprised at the size when they finally gathered around. 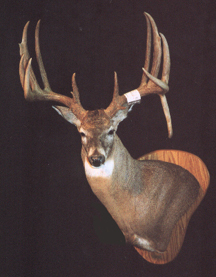 it was hailed as a real monster buck. Lots of people showed up at the check station to get a good look at it. Field dressed, it weighed in at 205 pounds and this was after the peak of the rut had passed. He was still in pretty good shape physically, and none of the points were broken, explained the young man.